Being handed a puppy is always a special moment. The first time I got home to find my own tiny ball of fluff scampering around looking for socks was the best surprise I’ve ever had. For a person with learning disabilities the introduction of a canine best friend can transform their life in a myriad of ways many of us cannot begin to understand. At just eight years old, Hugh from Birmingham has already had to overcome more challenges than many adults. Young Hugh was born with a rare genetic disorder known as FOXG1 syndrome, which severely impairs various aspects of development and causes structural brain abnormalities. 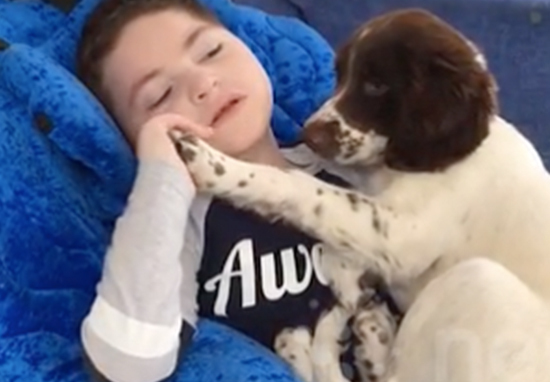 This severe condition is characterized by seizures, inability to control body movements, and lack of speech. While the spectrum of abilities is quite broad depending on the exact genetic mutation, many of our children cannot walk or talk, and they struggle to communicate their most basic daily needs. Although symptoms may vary between individuals, common indications may include excessive crying, poor eye contact and difficulties feeding. 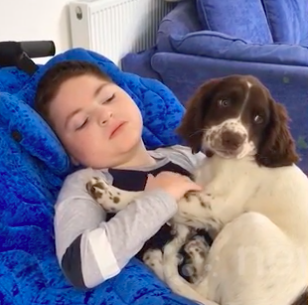 Just one month ago, Hugh made a brilliant new friend when his mum bought him a 12-week-old Springer Spaniel by the name of Barney. The bond between the two was immediately apparent. 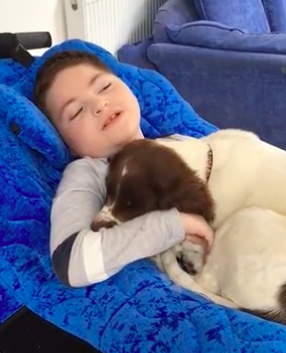 In footage posted online by Hugh’s mum, the child and the puppy can be seen cuddling up to each other in a chair, perfectly content with each other’s company. Hugh can be seen stroking his new puppy, as the little dog nuzzles into his arm lovingly. At one point they high five, and Hugh holds Barney’s paw in his hand. All the while Barney sits calmly on Hugh’s lap, looking very happy indeed with his new human. The lovely video was captured yesterday (July 30). Barney is learning to be incredibly gentle and calm with Hugh. This isn’t something we taught him and both my husband and I were moved to tears just watching the beautiful and unexpected interaction between Hugh and Barney. We thought long and hard about getting a dog. On the one side we hoped it would be good for Hugh, that they could have a special relationship but we were worried that our chaotic life (the frequent hospital trips) wouldn’t be fair on a dog. We looked at rehoming/adopting a dog but couldn’t be sure that an older dog would be able to handle Hugh and all the tubes and machines and beeping and erratic movements. But a puppy isn’t easy and, I’ll be honest, I want sure if we’d made the right decision getting one. Even though we spent ages deciding. And then tonight this happened. And I know that this is the right thing for our family. Hugh even stroked him and reached out to hold Barney’s paw. What makes this even more amazing is that this same 13 week old puppy spent most of the day running around wildly, jumped on, and nibbled the ears of, various children over the day, managed to tangle himself up in the nets of a football goal and has pretty much been hyper and bouncy and living up to his ‘Springer’ spaniel name. Maybe I caught him at a good time, or maybe he’s learning Hugh needs something different. Who knows? Either way, it was a beautiful, beautiful moment. 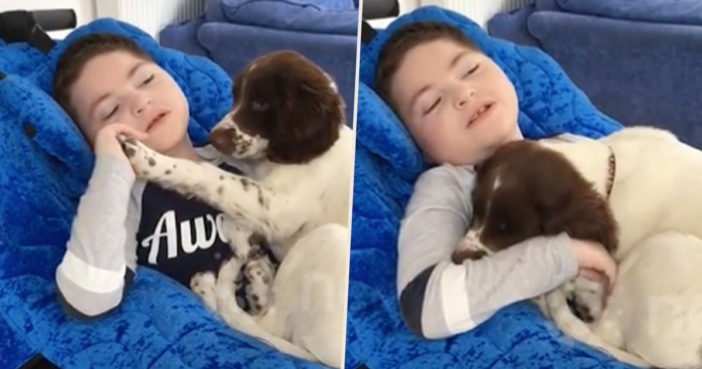 UNILAD wishes for many more happy moments between new best buddies Hugh and Barney, whose friendship perfectly illustrates the loving nature of dogs. Find out more about FOXG1 here.